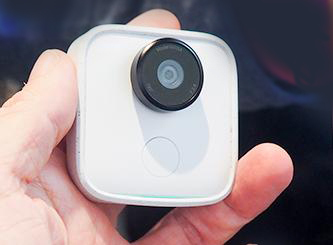 Google Clips is a new camera from Google that is very different from every other type of camera. You turn it on by twisting the lens, then set it down and forget about it. Google Clips sees everything in its 130-degree field of view. But it only records seven-second moving images of stuff it finds interesting. That’s right. It doesn’t require an operator. It actually works better on its own. Over time it learns faces and tries to photograph those people more and make fewer shots of strangers. Those faces can also belong to pets. Artificial intelligence has entered the world of photography. When this artificial intelligence camera decides which faces and pets to shoot, it tries to make photos of smiles and actions or unusual situations. As any shooter knows, taking candid shots results in lots of unusable shots. Google clips knows to discard out of focus shots. Each shots is a burst of photos at 15 frames per second. You can use this as a GIF or choose the best still frames as photos. The camera does not record sound. It’s just for photos or GIFs. It also does not have a viewfinder. Although you can hold Clips and take shots when you want, it’s really best when you just set it down somewhere in the room while you and your family go about doing whatever it is you’re doing. The camera comes with a silicone clip that wraps around the camera at any angle, so you can stand it up more easily or clip it to things. This artificial intelligence camera is intended for parents and pet owners. One reason it works so well is that kids and pets often stop doing that cute thing you want in a photo when they know they’re being watched. So leave the camera and walk away. You will get the shots even though it’s not as much fun as taking them yourself. Parents want lots of pictures of their kids or pets. But getting those shots can interfere with the normal flow of things. The kids or pets you’re trying to shoot rarely cooperate to give you that candid fun shot. But when you can set the camera and forget it, you’ll often find when you come back later that the camera captured some amazing moments by itself. You could attach Google Clips to your clothing, but the results are better when you don’t. This is just beginning of how artificial intelligence will affect our lives. The parent cam could be just the first step. Next may be A.I. cameras in dash cams, webcams, and security cams. The goal or product of the camera is no longer just photographs, but data with insight. The face recognition takes place in the camera, not in the cloud. And the pictures are stored on the device, not in the cloud. An artificial intelligence camera could be a big invasion of privacy, but Google considered that. That’s why nothing is connected to Google’s cloud, except those photos you choose to save to Google Photos. Facial recognition is an important part of the deal. That too only happens within the device and not in the cloud. The shots are encrypted in the camera. So there’s no worry if you lose the camera. Google Clips recognizes faces only when they are often in the view. Those faces that are not frequently viewed are ignored. So if you’re in a public place like a sports field, Clips tries to only photograph your kids. The camera is not intended for use by photographers. It is for parents who do not want to take the photos themselves. It uses A.I. to make the decisions for you. There’s no viewfinder, and the shutter button was literally an afterthought. The original version of this artificial intelligence camera did not have a shutter button. The artificial intelligence makes most of the decisions for you. A security camera could work the opposite way so that it looks for unfamiliar faces rather than familiar faces. These unfamiliar faces could be zoomed in to, tracked and recorded. The A.I. would be designed to identify suspicious people or behavior. These shots would be sent to the security force. Weight 2.1 oz. 1.9 inches square and .8 inches high. Up to 3 hours of smart capture. Auto focus and Auto exposure. Includes a clip stand, but is also designed to stand on its own. You do have to pair it to your phone either Android or iOS. Will be available from Google in the near future MSRP $249. You can read more and get on the waiting list here.